What is the strongest incentive for mobile game developers to expand their business into Indonesia? It is simple. Population. Indonesia is the 4th biggest country after China, India and The United States. There are 256 million people. Moreover, smart phone penetration is increasing remarkably especially in recent years. We estimate that there are 70 to 80 million smartphone users in the country. As the smart phone penetration is roughly 30 % across Southeast Asian countries, consequently, Indonesia by far has the biggest audience. So now we know about population size and fast penetration rate of smartphones. Our real interest is whether these users would actually pay for mobile games or not. To answer this question, the number of gamers and credit cards issued in Indonesia will be very helpful. One remarkable finding is that about 70% of the population is taken up by people under 30 who typically has higher willingness to spend money on mobile games. Moreover, there are many mobile game players. It is, on the other hand, apparent that the in-app-purchase market is premature as penetration of debit card is less than 50% and credit card penetration still stays less than 10%. We should not hold our breath for credit card penetration to rise in the near future as Indonesia still has a great income gap and high unemployment rate. So far I have explained how Indonesia is a highly desirable market with a potential to grow. But the in-app-purchase culture has not developed much yet. 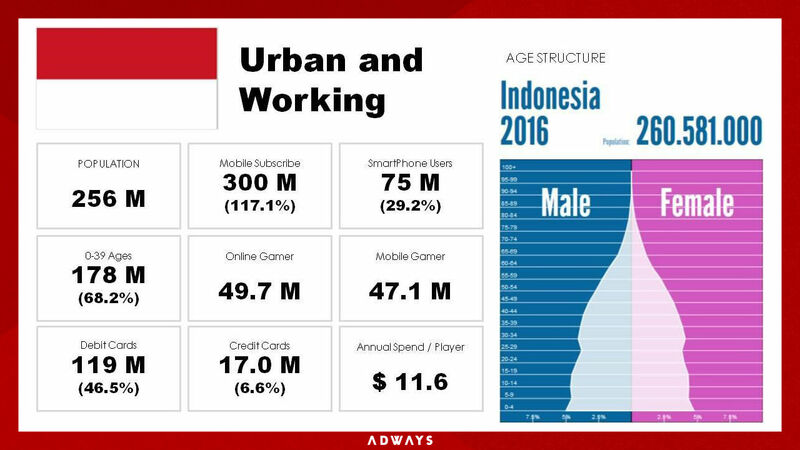 From autumn 2015, however, we are certainly seeing the increasing number of companies from Greater China and Korea going into Indonesian market as the number of mobile game players grow significantly. Around the same time, the amount of inquiries regarding our services in Indonesia has started to increase and some developers have tried to tackle Indonesian market through our services. As more countries and developers try to conquer Indonesian market, there are more app marketing methods practiced in Indonesia now. In following chapter, I will focus on the details of preexisting mobile app marketing in Indonesia.